Powerchief has been in operation since 1958. It began as a service station in the downtown area and over the years has moved and evolved. It moved to its current location and began to focus on auto body repair instead of fueling and mechanical repair. Powerchief has also seen a few changes of ownership. Currently Ben Hildebrandt is heading up this 'company with history' and enjoying the chance to help you right the wrongs with your vehicle. Everybody wants to say that they have the best of the best working for them. But we really believe that to be true. Our shop foreman, Dion Hildebrandt has been interested in auto body since he was a young boy. When it came time for High School, he was lucky enough to attend a school that offered auto body as an option. Under the tutelage of Dave Watson, Dion honed his skills and grew more intrigued. He went on to be employed by Nesbitt Patfield, a legend in the custom hot rod world. While working for Nesbitt he pursued his apprenticeship at the Southern Alberta Institute of Technology (SAIT) and won the Apprentice of the year award in 1996. Another employee that has risen above his contemporaries is Devon DeBoer. Devon recently faced off against the world in the Autobody segment of the World Skills competition. Judging criteria from the week long event included sectioning skills, plastic repair skills, measuring and accuracy, metal repair techniques and theoretical knowledge. Time, safety precautions and quality of repair were also considerations. Devon is a talented and driven bodyman that placed very respectabiy in the competition. 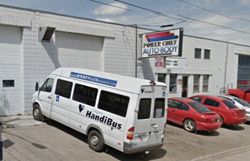 We are proud to be assembling a team of skilled and commited auto body specialists. Every one of our staff members is currently excelling in their apprenticeship courses.